Troy Dreier: Hi, everyone. This is Troy Dreier coming to you from Streaming Media East 2016, where I'm very pleased to be having brief conversations with some of the thought leaders of our industry. I'm talking right now with Omer Luzzatti, head of video content platform for Yahoo. Welcome. Troy Dreier: Live video has been so important to Yahoo's development, we're seeing some amazing concerts from you guys, and then a big deal with the NFL. Are content companies, major producers more willing to start doing something live? Omer Luzzatti: Yeah, exactly. This is what we see in the last month, with the content owners. They're ready to open their negotiations to ... They're looking into what's the next phase, what's the next stage with video, and OTT and playing in the internet is obviously one of the key factors there. The NFL did a huge move, broadcasting with the Yahoo, for the first time, the game was only available over the web and not over the TV, other than within the local market of the teams themselves. Troy Dreier: What other major content companies are you working with? Omer Luzzatti: Oh, NHL, MLB, PGA, Live Nation as we've described. And we produce our own live streams around news, finance, and Warren Buffett broadcasted with us in April now, which was also a huge success. Troy Dreier: Sports is just huge for live. Omer Luzzatti: Sports, definitely, and also through other events, as well. Troy Dreier: Is this worldwide, or is it the US, that you're doing it? Troy Dreier: Are you involved in more consumer-oriented things with live, too? I mean, that's also a big push. Omer Luzzatti: We have Flickr and Tumblr, as more UGC or semi-professional broadcasters, and we are opening them especially for VOD today. We see other companies, and that's another trend that is happening, the big companies now, especially Facebook, Google, Twitter, starting to bring UGC live streaming as well, so definitely, live streaming for UGC content is also something that is booming now. Troy Dreier: Companies that haven't experimented with live, what should they be doing right now? Omer Luzzatti: Depends on the type of the company. If you're a content owner, definitely go and try to find the right platform. Try, how to bring your content and how to monetize your content over the internet. It should be an additional to your TV, and you shouldn't see it as a battle between TV and the internet. If you are a UGC type of social player, internet social player, then obviously you should be aware of what Facebook and Twitter is doing, and to try to compete if you have the abilities. Troy Dreier: Well, thank you so much. This is an area that everybody's watching. Really a lot of development going on. I appreciate you stopping by. 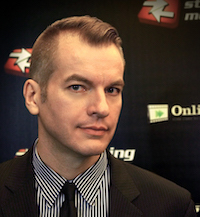 This is Troy Dreier, coming to you from Streaming Media East. There's no room for error in a live video broadcast. Plan ahead by capturing data that points to specific issues, and have tools and partners ready to fix any problems. The global NFL streaming experiment was successful, delivering streams to 185 countries and selling out all ad inventory.